Intelliga was first approached by the Danville d’Elegance Foundation in late 2010 for assistance with a new site to support their 2011 events. 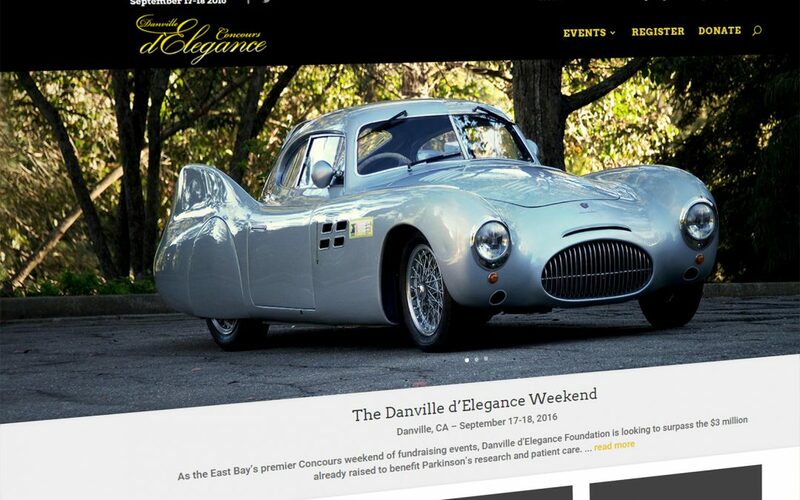 The Danville d’Elegance Foundation had lost touch with the individual who had helped them to that point, and Intelliga navigated past a number of administrative obstacles just to be in a position to deploy a new site. After taking the time to understand the specific needs of this registered charitable organization, Intelliga moved forward with a new site design and created content to elevate the Foundation. After five years of reliable service and continued compliments on that first site, Intelliga wanted to apply new web technology and design principles, and to simplify event registration and site maintenance. The result, after a number of months of hard work, is a site that we are proud to put our name on once again. The new site at www.danville-delegance.org has been built on WordPress using a custom child theme on top of the popular Divi 2.x theme by Elegant Themes. An interesting aspect of the build was the desire to retain the existing database and registration management tools that were custom-built by Intelliga for the previous web site using the Microsoft .NET platform, and integrating this into the PHP environment that WordPress utilizes. We built all-new event registration pages with .NET, and utilizing CSS styling from the Divi theme. Getting these pages and the existing admin tools to work alongside the WordPress PHP code was accomplished through careful configuration of the web server, all without compromising site performance. A great deal of thought and work went into ensuring that the new site is “responsive”, meaning that a single instance of the web site code displays and functions appropriately (sometimes differently, but always by design) on large, high resolution desktop screens and small, sometimes low-resolution mobile screens alike. Though the Divi theme did much of the heavy lifting, design customization and content construction needed to be carefully thought out. Let Intelliga help elevate your brand image! Contact us for more information on building you a new web site that utilizes the latest technology.